Erect, branched, fleshy annual herb, about 1 m high. Stems, purplish and 4-angled. 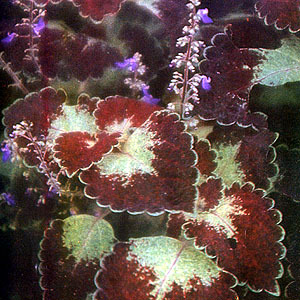 Leaves are blotched or colored, ovate, 5-10 cm long, with toothed margins. Flowers are purplish, numerous, in simple or branched inflorescences, 15-30 cm long. Introduced in the Philippines. Cultivated for ornamental purposes. Bruises and sprains: Crush or pound 10-12 leaves and apply over the ankles, wrists or affected areas for 30 minutes, three times daily. Use a bandage to hold the poultice in place. Carminative: Take decoctions of leaves. Headache: Pound leaves and apply over temples and nape. Mild bleeding of wounds: Wash the young leaves; crush and extract the juice. Drop a few drops of the juice directly on the wound. Apply the crushed leaves as poultice. Sinusitis: Heat 10-12 fresh leaves over a fire; apply while still hote over the forehead for the frontal sinues or over the cheeks for the maxillary sinuses, twice daily. Decoction, taken internally for dyspepsia; also used as eyedrops for eye inflammation. This entry was posted in List of Medicinal Plants in the Philippines and tagged mayana, medicinal plants on March 22, 2009 by Pinoy Herbs. mayana leaves is very popular in province like occ,mindoro it is good for healing wounds…………………… thank you. Huy ayusin nyo,pano ba patubuin to?Ung may utak na sagot ah!!! panu gawing isang makulay na nail polish ang mayana leaves? ano po ba yung mga pests and diseases na makikita sa mayana plant??? ,an0 sa english anq mayana ? I love mayana as an ornament. I have more than sixty variety. All beautiful! Please feature gisol or galangal.. I have about 25 varieties of mayana and still searching for more because i love this ornamental/medicinal very much.i hope those who have more varieties will share it with me.thank you. Thanks sa mga ideas and comments shared with us. My MAYANA plants is almost 30 varieties. Nakakawala ng stress at nag eenjoy po ako sa pagaalaga. What is the scientific explanation on how this plant helps headache?